Just as the Windows 8.1 release date of Oct. 18 draws near, we're hearing that the Windows 8 update has made its way to manufacturers. Its release to manufacturing (RTM) status means that developers and users are next in line to get the anticipated update, now less than two months away. 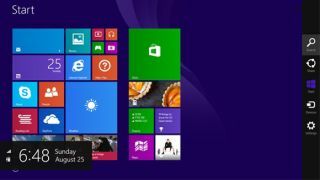 The Windows 8.1 RTM went out on Aug. 23, according to Windows SuperSite blogger Paul Thurrott, who later followed-up his report with purported screenshots of the RTM version. Additionally, two sources corroborated to ZDNet that manufacturers received the update on Aug. 23. Conflict with Ballmer departure news? The announcement of the RTM status for Windows 8.1, codenamed "Blue," may have been delayed from its actual release day last week because of Microsoft's other "blue" news. Microsoft CE, Steve Ballmer, announced that he would retire within the next 12 months, ending his decades-long tenure at the company and 13 years as Bill Gates' successor. However, other sources have claimed that Microsoft was always targeting today as the day Windows 8.1 would reach RTM status. Officially, Microsoft hasn't confirmed which date - if any - that the Windows 8.1 update went out to manufacturers. TechRadar asked the company for more information and will update this story when we hear back. Either way, it's good news that Windows 8.1 has made its way to RTM status, as the Oct. 18 release date will be here before we know it. Read how to download Windows 8.1 Preview free today.